Switzerland really is a grand destination to visit, and a grand way to explore it is on the Grand Train Tour of Switzerland. Despite its mountainous terrain, this small land-locked European country is criss-crossed by railway lines. Trains travel through tunnels and twist along scenic routes, leaving travellers to sit in comfort and admire the stunning scenery through large panoramic windows. Many trains have on-board buffet cars and some – like the famous Glacier Express – offer passengers dining in style as they journey between the alpine ski resorts of St. Moritz and Zermatt. Most tourists fly into Zurich Airport with the train station immediately below the airport where trains depart for St. Gallen in eastern Switzerland near Bodensee on the border with Germany. Two essential stops along the way are Schaffhausen and Stein am Rhein to admire sections of the mighty Rhine River, which flows out of the Bodensee (Lake Constance). Not far from Schaffhausen, the crashing falls across the Rhine River are a sight to admire and to take a boat ride across the turbulent waterway. From here, proceed by boat or take the train to Stein am Rhein, a small well-preserved medieval town. Continue onto St. Gallen to inspect the famous Abbey and its historic library, now a UNESCO site. Travel tip: One of the best ways to explore Switzerland is by using a SWISS Travel System pass on trains, buses and ferries plus many mountain railways. This route heads southwest from St. Gallen and along sections of Lake Zurich, past Rapperswil and on the Voralpen Express into the famous lakeside city of Lucerne. Scenic Lucerne can be explored on foot immediately from the train station. Store your luggage in a coin-operated locker and walk to the historic covered footbridge that dates back to 1333. Plan to be in Lucerne on a Saturday as there is a lively market near the old wooden bridge. Ferries operate to various towns around the clear turquoise waters of the lake with destinations such as Bürgenstock, Brunnen (home to the Swiss Army knife) and, Rütli Meadow where the Swiss Confederation was formed centuries ago. Not far from Brunnen is the world’s steepest railway that operates up the near-vertical slope to the small village of Stoos. Upon returning to Interlaken, join the Golden Pass train on its journey through the scenic Simme Valley to Zweisimmen where cows graze on lush alpine meadows. It then winds its way down the escarpment, through the famous Lavaux with its near-vertical wine terraces and into the resort down of Montreux on the scenic shores of Lake Geneva. The train passes through Interlaken positioned between the two beautiful lakes of Brienz and Thun. Interlaken is also the departure station for the famous mountain Jungfrau Railway, the highest in Europe. The popular town caters to tourists and offers many adventurous activities in both summer and winter. There are two train stations in Interlaken Trains and those for the Jungfrau depart from Interlaken Ost Station and not Interlaken West Station. 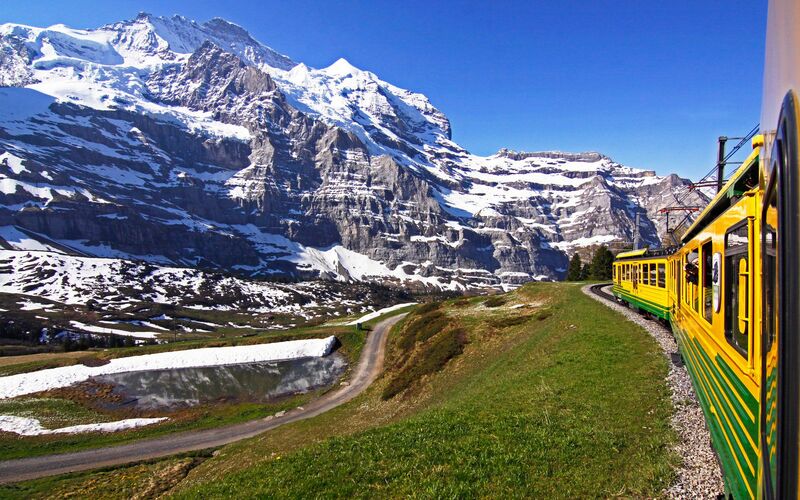 As railways go, the tracks up the Swiss Alps to just below the summit of the Jungfrau are some of the highest in the world and the rail journey is an essential journey for anyone visiting Switzerland. There are several train routes up to ‘the top of Europe’ and some that just go to villages at lower altitudes. One of my favourites is Schynige Platte, located 1,967m above Interlaken but serviced by an historic cogwheel train. This thrilling train journey starts at Interlaken Ost with a change of train at Wilderswil. Here the two-car heritage train departs for its slow ascent up to Schynige Platte situated to the southeast of Interlaken high above the Brienz Sea. It follows a circuitous path through alpine meadows with grazing cows. The summit views are amazing and several well-signposted walks start from the hotel here with one of the longest across to the alpine village of First, some six hours away. The summer months of June to July are best for wildflowers, butterflies and bees but they are also the most crowded. The train operates from the end of May until the end of October and the journey takes one hour. Traditional accommodation is offered in the Berhotel Schynige Platte where they have retained the rooms in their original state. Plan to be in Montreux in December for the Advent Markets or in June to July for the legendary Montreux Jazz Festival. At other times, enjoy walks along the lake promenade, lake cruises, or visit famous Lavaux wineries and enjoy white wines made from Chasselas grapes. Head to the station for the train into the Valais and from Visp, up to the ski resort of Zermatt and the famous Matterhorn Mountain. A recommended side trip is on the PostBus up to Visperterminen to sample the iconic Heida wine produced on the steep mountain slopes. There are several daily Glacier Express trains departing from Zermatt to St. Moritz (they also operate in the reverse direction from St. Moritz to Zermatt). Like several other Swiss trains, the Glacier Express has carriages with panoramic windows that extend almost across the ceiling to enable excellent views of the spectacular countryside. There is no rush either as the train is known as the world’s slowest express train. The Rhaetian Railway weaves through the valley of Albulatal to Engadin and onward over the famous Bernina Pass southward into northern Italy. It forms and integral part of the famous Bernina Express that passes from Chur in Switzerland’s Graubünden canton, past St. Moritz, over the Alps and along the Poschiavo Valley down into Tirano in northern Italy. A coach then transfers passengers across northern Italy to Lugano in Switzerland’s Ticino canton so passengers can continue their Swiss Grand Train Tour of discovery on other legendary railways. While the total travelling distance and time from Chur through to Lugano is 260km and takes about 7.5 hours, the scenery and attractions along the way are worth exploring over a few days. This scenic rail route twists and weaves up and over the Alps via numerous bridges, tunnels and viaducts. Most were cut through rock by hand, explosives and much simpler technology than used today. All are amazing engineering feats, with some dating back to 1848. The Bernina Express crosses the famous Landwasser Viaduct (the highest bridge on the railway), Alp Grüm Station (the highest point of the railway at 2,090m) and, the impressive Brusio Circular Viaduct. Recently, the Rhaetian Railway celebrated ten years as a UNESCO site and a grand parade of old trains was displayed in and around Pontresina. Crowds in their thousands enjoyed old steam trains such as ‘Heidi’ which carried eager enthusiasts and children between Pontresina and Samedan over the weekend. Wilhelm Tell is a folk legend in Switzerland and the express train is a legend in rail travel. Lugano is one of the more fascinating parts of Switzerland, that is more Italian than Swiss. Stay beside Lake Lugano or in Ascona on Lake Maggiore before catching the train across the Alps (an alternative is via the new 57km-long Gotthard Tunnel but this has no views) to admire the incredible scenery. At Flüelen, passengers join a Belle Époque paddle steamer across Lake Lucerne back to Lucerne. The shortest journey on the Grand Tour is that from Lucerne back to Zurich to complete a 1,280km loop. The train passes picturesque Zugersee and then along the southern shore of Lake Zurich before travelling through West Zurich into the main train station. This journey is a time to reflect upon the amazing Swiss scenery of alpine meadows, snow-capped mountains, glaciers, and lakes as well as its famous cities and town. A train really is a small world moving through a bigger world and while those who love trains maybe content to sit on Swiss trains all-day long admiring the scenery along the way, others will want to get on and off at the many places of interest. The Swiss Travel Pass enables this and ferries and buses await each train arrival to transport people to their next destination.